Colin McRae Rally 2005 is a the 2005 installation of the McRae franchise. 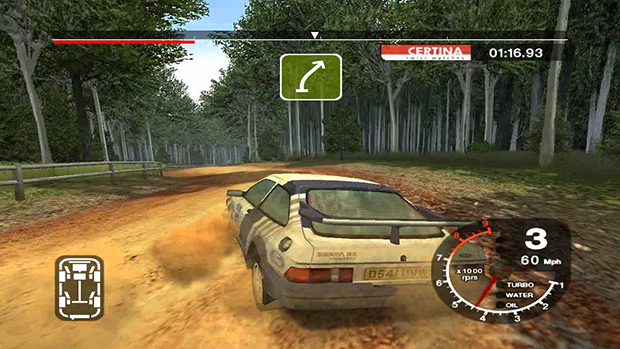 It was released for Windows, PlayStation 2, PSP, Xbox and Macintosh and has over 70 stages spread over nine countries: Australia (loose gravel), Japan (tarmac), Finland (gravel), Greece (rough rocky gravel), UK (tarmac, mud, and gravel), Spain (smooth tarmac), USA (gravel/dusty tarmac), Sweden (snow and ice), and newcomer Germany (abrasive tarmac/light gravel). The game’s graphic engine allows for more realistic damage effects and a blurred vision effect if the player comes into contact with a hard object.